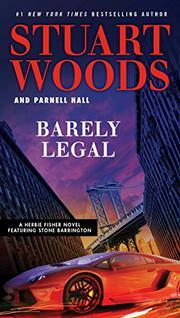 Perennial bestseller Woods and veteran Hall, who’ve already teamed up to spin a yarn starring Teddy Fay, the ex–CIA operative gone spectacularly rogue (Smooth Operator, 2016), give New York attorney Stone Barrington’s rising-star partner and former client Herbie Fisher a case of his own. Not that it’s really Herbie’s case. He’s just the lawyer at Woodman & Weld who answers the phone when his colleague James Glick, stricken with appendicitis, is looking for someone, anyone, to take his place in the courtroom and appear on behalf of David Ross, a pre-law student at Columbia caught at a party with a pocketful of cocaine, whose father, a city councilman, has arranged a sweetheart plea bargain that will keep his son out of jail. The plea bargain is authentic, but the appendicitis isn’t: Glick’s desperate to get out from under the demand that he lose the case pronto so that David will go to jail, where vengeful real estate mogul Jules Kenworth can use his vulnerable position to keep putting pressure on the councilman. And the kid, insisting that he’s innocent, refuses to take the deal. So Herbie, who thought he’d be spending 10 minutes in court, ends up cross-examining witnesses whose testimonies he knows nothing about and, in the process, mightily, though unwittingly, angering Tommy Taperelli, the fixer Kenworth has engaged to ensure a guilty verdict. Dazed and confused, Herbie can hardly wait to return to his Park Avenue penthouse to spend some quality time with his fiancee, Yvette Walker, an actress out of the Yale Drama School. Now if only Yvette weren’t really a call girl up to her neck in a scheme to fleece Herbie and leave him at the altar holding the bag…. The weightless style is Woods’, but the smartly engineered complications involving multiple malefactors who plot at serenely oblivious cross-purposes are right out of Hall’s stories about sad-sack private eye Stanley Hastings. Woods, who’s often mysteriously immune to plotting, may have found the perfect partner.